(Bloomberg) -- Some investors see plenty of reasons to bet against Canada’s big banks. Don’t count Bill Morneau among them. 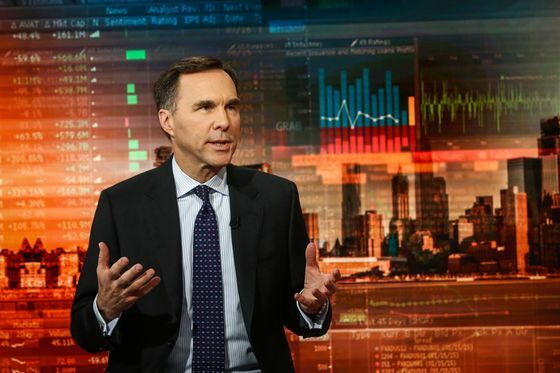 Canada’s finance minister, who’s visiting Washington for a series of meetings with policy makers, was asked about recent news reports that some investors are short-selling the country’s biggest lenders. After a brief caveat that he wasn’t trying to give advice, Morneau laid out a defense of the sector. The banks are well-capitalized and not overexposed to credit risk, he said. The broader economy is doing well and the government continues to work on what he called a core risk of household indebtedness. All that adds up to a good view of the lenders. Some short-sellers have been targeting Canada’s indefatigable banks, which soldiered on through the financial crisis a decade ago and are up about 9 percent so far this year -- even as household debt hovers near record levels and signs emerge of softness in Canada’s economy. Policy makers have taken a series of steps to cool the housing market in particular to try and avert any bubble, targeting Vancouver and Toronto in particular. Morneau cited that as a pillar of the outlook for the banking sector. Morneau delivered his fourth budget last month, ahead of a federal election this fall. He and Prime Minister Justin Trudeau’s Liberal Party are trailing the rival Conservative Party in most polls.